In a clear effort to electrocute himself with powerlines or just cut his head with a traffic light, someone has created a 12-foot-tall bicycle from scratch. 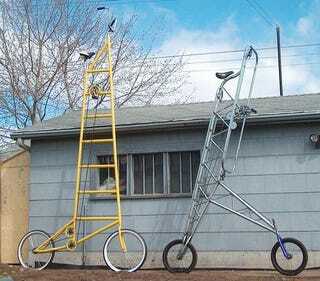 Called the SkyWalker TallBike, these bikes are not for the faint of heart. In fact, they are built for absolute lunatics. In other words, I want to ride one. Update: We talked with Brad Graham, the inventor, about how it was made and how it really works. Details and more picts after the jump. According to Brad, the 12-foot SkyWalker is so strong that it can easily take a 500-pound pilot, a little trivia fact that makes me imagine a Fantasia hippo driving one. The bike has a built-in ladder that stops just bellow the seat, obviously to get you to the top while giving you enough space to pedal comfortably. The distance between the seat and the pedals makes it suitable for most people between 5'-8" and 6'-4. Jesús Díaz: How much time did it take you to build this bike? Brad Graham: SkyWalker was made in a single weekend. All welding was done outdoors in -10 degree weather using a basic AC welder. JD: You built it with spare parts, right? BG: Yes. All parts were scavanged from the local dump with the exception of a few lengths of hardware store electrical conduit for the frame. JD: OK, and now the really OMFG part: how the heck do you ride this thing? BG: The bike is very easy to ride if you trust it. Climbing the ladder while it is in motion takes some time to get used to, but after a few tries, I was able to get to the top with a coffee in one hand. Many people tried SkyWalker, and had no problem at all riding it.